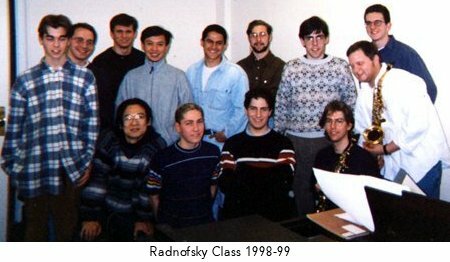 Like many of the leading saxophone studios today, Radnofsky's students get exposed to a wide variety of repertoire. Some works are required to be studied and performed by each student but the aspiring saxophonists also get a chance to choose works to study. Radnofsky points out that this method is loosely based on the Paris Conservatory model and that it works quite well for him. Works recently performed by his students include Cowell Air and Scherzo, Husa Concerto, Denisov Sonata, Denisov Duo with cello, Bach Suite in D Minor (cello), Martino Concerto, Prokofiev Sonata (flute), Albright Sonata, Rachmaninov Sonata (cello), Creston Sonata,Heiden Sonata, Ibert Concerto da camera, Muczinski Sonata, Poulenc Sonata (oboe), Richard Rodney Bennett Sonata, Wuorinen Divertimento, Harbison Sonata, and Vaughan-Williams Concerto (oboe). This is just a sample of what's been performed in the last twelve months. "There were many more works performed," adds Radnofsky, "but I didn't make a list." By their sophomore year, Radnofsky says his students are "playing all the time." With performance class, quartet, half recitals, and then full recitals and outreach performances in the community, they prepare for performing as an important part of their careers." At the Community Music Center of Boston, an original Settlement Music School now ninety years old, his younger students have their own performance hours. As Associate Director of the school, Radnofsky says that, " working at this community school has more meaning for me than any career highlight as a performer. Seeing students grow, and having some part in their growth, has great meaning for me." It's difficult to believe that Kenneth Radnofsky has the time to do all that he does. This is not a singular situation. All the really good teachers are like this. It's a sign of dedication to one's art. It's this sense of dedication to art that the good teachers pass on to their students. It's what makes the tradition of music making endure through the centuries. There are many good teachers in the world and they deserve to be celebrated. Do I love to teach? I teach because I HAVE to TEACH. I don't HAVE to teach. There is a voice inside me that demands that I teach. I hear voices. - Uh, Oh. Until they hear their own voices. My students stood on my shoulders. My students are no longer my students. They love to play music. Bruce Ronkin is Chairman of the Music Department and Director of Music Industry Studies at Northeastern University. He is co-author of The Orchestral Saxophonist Volumes 1 & 2 and the editor of 150 Years of Music for Saxophone by Jean-Marie Londeix. As editor of The Adolphe Sax Series, published by Roncorp Publication, he is making some of the earliest music published for saxophone and piano available once again to saxophonists worldwide.